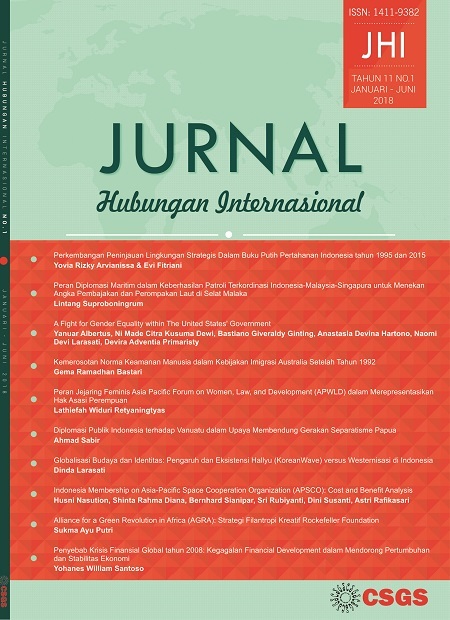 Jurnal Hubungan Internasional is a scientific journal published twice a year, every June and December. JHI invite discussions, reviews, and analysis of contemporary against four main themes: international peace and security; international political economy; international businesses and organization; as well as globalization and strategy. JHI published by Cakra Studi Global Strategis (CSGS), center of studies that examine the issues of international relations and this center of studies was under control by Airlangga University International Relations Department. Jurnal Hubungan Internasional is licensed under a Creative Commons Attribution-NonCommercial-ShareAlike 4.0 International License.